What does The Alternative Board Franchise Cost? Owning your own TAB business provides you with a tremendous amount of flexibility, variety and control. As a TAB Franchise Owner, you will discover the true meaning of work-life balance. Your diverse array of day-to-day tasks and activities will build networks around your community for which you serve as the primary hub. When was the last time you woke up before the alarm clock and couldn’t wait to get started with your business day? There are very few business opportunities that provide a genuine sense of personal satisfaction combined with financial success and flexibility. 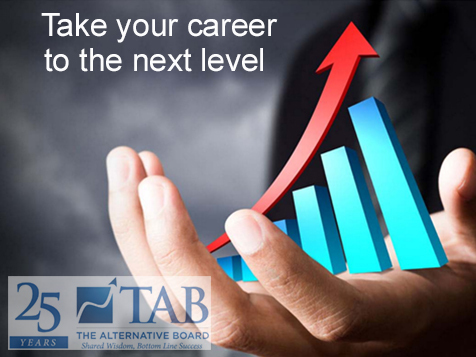 The Alternative Board ® (TAB) franchise opportunity provides just that. TAB provides both a Standard Franchise and an Optional Franchise Fee alternatives. TAB franchise owners have a purpose to what they do. They make a difference in the businesses and the lives of their members. Business owners, CEOs and Presidents of private businesses join TAB as members to improve their businesses and their lives. Members pay a monthly fee for participating on a TAB Board. This subscription model provides a reliable monthly income stream and does not have the peaks and valleys of consulting businesses. TAB franchise ownership is complementary to an existing consulting business. TAB franchise owners lead monthly business owner advisory board meetings where members present issues they're facing in their business. Based on the collective experience of the board, members receive real-world, practical advice on how to solve challenges and seize new opportunities. TAB franchise owners also provide business coaching to individual members and their companies using proprietary tools and processes. TAB provides comprehensive training and extensive support to help franchise owners launch and grow a successful business. "Once I become a TAB franchisee, I knew that this is exactly what I wanted to do for the rest of my career. I love helping business owners achieve their full potential. The support from corporate has been outstanding. I feel very fortunate to be able to do what I love and make a great income along the way." It is a Subscription Model where members pay monthly membership dues. The monthly dues provide a reliable monthly income, unlike the “feast or famine” model which is common with consulting businesses. Franchise Owners become the Trusted Advisor of their members. As a result, when a member needs help, they turn to their facilitator. A significant additional consulting income opportunity exists. "Being part of the TAB family has been a great experience. My income has steadily grown as I have focused on growing my business. Additionally, the professional and personal growth I have experienced working with TAB and my TAB members has been fun and extremely rewarding." As a TAB Franchise Owner, your days will never be the same. You will enjoy a fast-paced, high-energy lifestyle with the newfound freedom afforded by proven franchise methods. "TAB has afforded me a quality of life most other business owners are envious of by providing a revenue model that allows for a consistent revenue stream as well as other product or consulting income." TAB Franchise Owners come from a wide variety of backgrounds. A typical new TAB owner was previously a successful executive in a large company, an owner of another business or a strategic business consultant. Many new TAB owners that have an existing consulting business join TAB to serve as a complement to their existing business. You may be wondering whether you have the right background to facilitate boards and advise private business owners. While our standards are very high in terms of the caliber of candidates that we select to run a TAB business, we provide a comprehensive training and support program to assist candidates with diverse backgrounds to be successful as TAB Franchise Owners. "TAB, throughout its 25-year history, has developed an amazing portfolio of tools and processes and support to help any franchisee who has the commitment and desire to be successful - be successful." There's no right or wrong background to come from. There's no golden qualification or former position held that will make you a great success as a TAB Franchise Owner. The only thing guaranteed to ensure your success is YOU. As with any business, what you get out depends on what you put in. Successful TAB Franchise Owners have many characteristics in common. Our brand's success is based on the quality of the people we invite into the system. Ideal candidates are transitioning executives, experienced consultants and former business owners, with experience in a senior-level role - either in a corporate environment or as a consultant to business executives. Our most successful Franchise Owners are aggressive, hungry to earn a great income, results-oriented and excited about long term growth. You've probably made lots of investments over your life. Have you ever considered investing in yourself? Owning a TAB business provides you this opportunity. If you're like most people who are explore running TAB Boards, then you have accumulated a wealth of business knowledge over your career. The TAB opportunity allows you to leverage this asset, make a modest investment and control your own destiny. This investment not only has the potential to lead to a significant income but is also an equity-building asset that you can then sell when you are ready to retire or pursue another venture. "I have been a TAB franchisee for over five years now and I am very pleased to state that... my cash flow is dependable, I have access to and from time to time use the TAB tried and true method of attracting new members, I have a very recognized brand and I am never alone! On a regular basis I am able to tap into the massive wealth of expertise and experience that my fellow TAB franchisees have and equally importantly I have easy access to the wonderful support staff at TAB head office who have demonstrated time after time that they are poised at any time to help me to continue to succeed."